Vietnam and the International Rice Research Institute (IRRI) can bolster cooperation in developing genetic resources and technology to improve rice quality, IRRI General Director Matthew Morell has said. 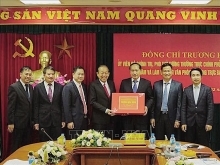 Working with representatives from the Ministry of Agriculture and Rural Development (MARD) in Hanoi on November 4, Morell said with its huge rice export capacity, Vietnam plays a vital role in ensuring the world’s food security. According to the general director, IRRI’s gene banks boasts natural genetic resources, genetic structures and outstanding rice varieties, which are vital to selecting important characteristics and varieties adaptable to impacts from climate change that Vietnam needs. IRRI can assist Vietnam in improving its rice productivity and quality, while reducing input elements such pesticides, fertilizers, water, labour and varieties, he stressed, adding that the institute’s studies can also help to minimise in-and post-harvest losses. At the meeting, experts from domestic research institutes expressed their hope to continue cooperating with IRRI in using genetic resources, personnel training and implementing studies on post-harvest and intensive processing technologies as well as researches on rice markets. 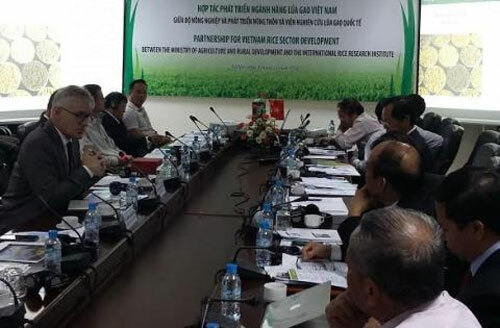 Le Huy Ham, Director of the Vietnam Agriculture Genetic Institute, said that Vietnam has a great demand for drought- and saltwater - resistant rice varieties. Vietnam started its partnership with IRRI in 1963. The cooperative relations have helped to create breakthroughs in agriculture, including selecting rice varieties with high yield and capable of adapting to negative impacts of weather, as well as promoting sustainable cultivation systems. The two sides have also worked effectively in preserving rice genetic persity, controlling and eliminating pestilent insects, and improving rice quality and value, smart agriculture, and training./.